Infectious complications are common and sometimes life threatening in patients with immune thrombocytopenia (ITP), mainly due to the immune-suppressive therapy. Recent evidence suggests a potential role of platelets in the inflammation process. In this clinical study, we further investigated the role of thrombocytopenia on infections in patients with primary ITP. We retrospectively evaluated data from the recently published large randomized clinical trial of a cohort of 195 patients with primary ITP, who were randomized for prednisone or high-dose dexamethasone. From 158 patients (81%), data on platelet count and infections within the first month of treatment were collected. In this period, 24% of the ITP patients had an infection. Patients with infection had significant lower platelet counts during the first month of treatment leading to a significant lower therapy response at 1 month and a significant longer hospital stay (14.0 versus 9.8 days). Additionally, Cox regression analysis showed that an increase in platelet count of 20 × 109/L led to a reduction of 52% in infections in the next week, showing low platelet count is a significant risk factor for infection. 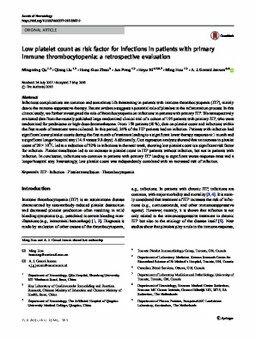 Platelet transfusion led to an increase in platelet count in ITP patients without infection, but not in patients with infection. In conclusion, infections are common in patients with primary ITP leading to significant worse response rates and a longer hospital stay. Interestingly, low platelet count was independently correlated with an increased risk of infection.